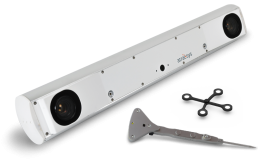 The fusionTrack 500 is a passive and active, real-time optical pose-tracking system specially designed to detect and track reflective spheres, disks and IR-LEDs in real-time video streams. 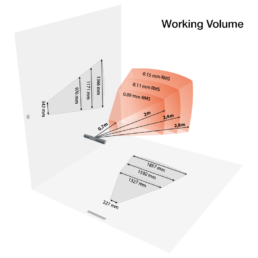 The fusionTrack is composed of two cameras that observe reflective and/or active fiducials (IR LEDs) simultaneously, and it uses triangulation to calculate their locations with unrivalled precision and with an unparalleled non-interpolated measurement rate of 335 Hz. When several fiducials are affixed to a marker, the system can determine its pose (position and orientation) with 6 degrees of freedom (x,y,z,α,β,γ). The fusionTrack can be customized to fit your requirements (e.g. precision level, acquisition speed, working volume, extensions). Moreover, the system is compatible with existing passive image-guided surgical tools that are widely used in the medical field. With its unparalleled measurement speed, accuracy and latency, the fusionTrack 500 is ideally suited for robotic applications.